This was one of the reasons why I selected this model, because I didn't want to have to discover that the battery is depleted when I need it, and AA batteries are easy to find. I replaced the batteries long ago with NiMH rechargeable batteries, but the camera is a bit picky on the input voltage and cuts off long before the batteries are depleted. I tried both NiMH and NiCd batteries just in case the discharge curve would be better on these last ones, but none really stands out of the lot. Below 1.2V approximately, the camera complains. 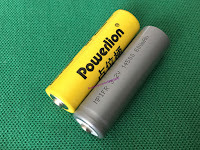 I found long ago a very interesting type of 1.5V lithium AA batteries made by Kentli. These batteries are in fact made of a smaller 3.7V lithium battery inside, followed by a DC-DC converter to emit a constant 1.5V voltage. They're pretty good for what they are doing. But they are not suitable for this type of device. Indeed, their output voltage regulator suddenly cuts off once the battery's capacity is too low, and the regulated output prevents the camera from indicating it's going to stop working. Not only it's unpleasant to discover that the battery suddenly is dead when you want to take a photo, but it usually fails with the lens out and exposed without protection which is not fun at all. 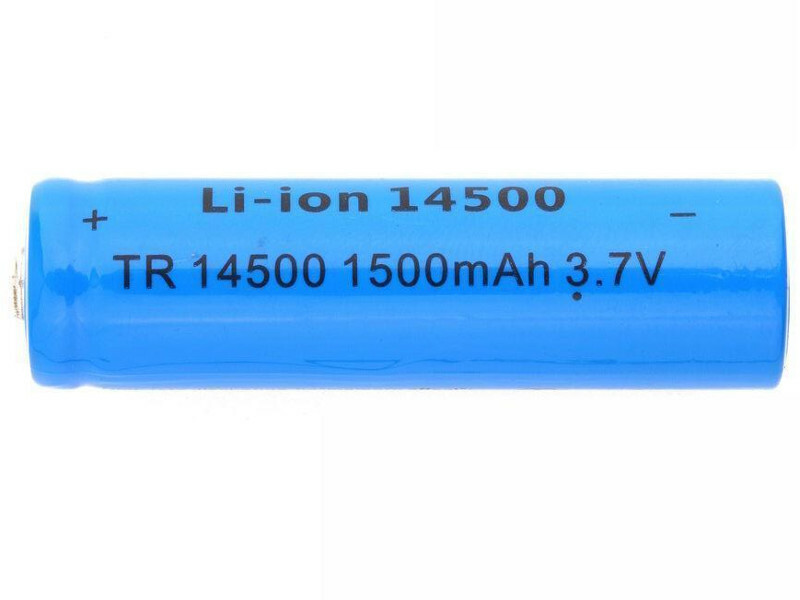 Ideally such batteries should lower the output voltage near the end so that the powered device detects the situation and can gracefully shut down or warn the user. But for torch lamps and laser pointers these ones are perfect. I was thinking that there's always some margin in devices designed to be powered by batteries, so if two completely charged AA cells can provide about 3.1-3.2V, surely a single LiFePo4 cell (3.2-3.3V approx) would be fine as well. 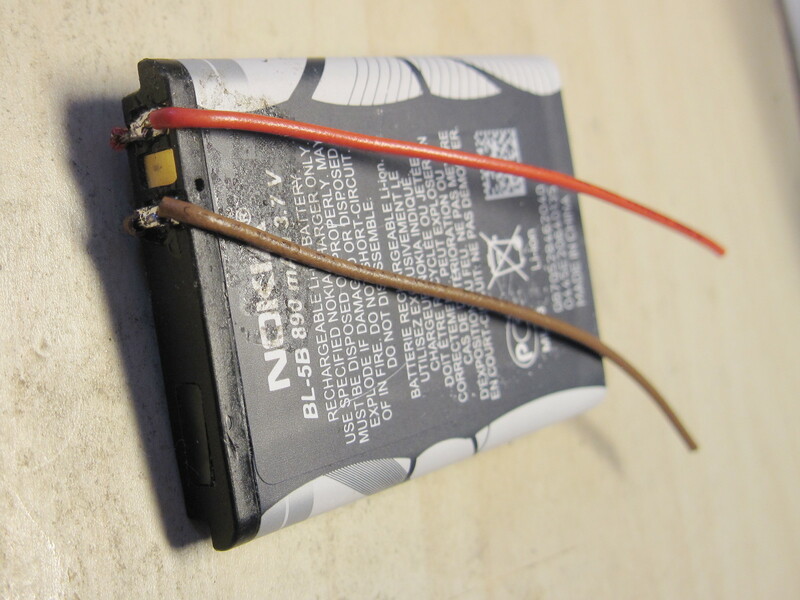 Such batteries are easily found on the net, sold with a spacer made of a simple wire, to replace the second battery without adding any extra voltage. 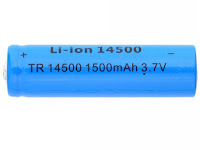 The problem with LiFePo4 is that the battery capacity is very low, 600-650 mAh on average so in the end I had an even shorter duration than with the NiMH ones. I figured that since the LiFePo4 cells send 3.6V to the device once fully charged, there's probably still a bit more margin, so I decided to try a regular 3.7V Li-ion cell (which reaches 4.2V when fully charged), again with the spacer to replace the second battery. Aside the difficulty to select the correct battery, it turns out that the voltage is perfectly suitable for this camera. The camera only warns once the battery is really depleted, and doesn't suffer from the extra voltage. I figured that I'd just have to spot a serious battery and would have an acceptable capacity with the ability to recharge it with a regular Li-ion charger. But isn't it too bad to lose half of the capacity in the spacer ? 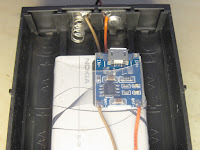 Then I figured that I could install the two in the reverse direction, and connect them in parallel, negative to negative and positive to positive using wires, and isolate one side of each battery so that the resulting block is still two batteries with a single battery voltage. Thus I tried. And that's done! I now have a 3.7V, 1700 mAh battery that presents itself in the same form factor as a set of two AA batteries and which delivers its whole capacity before the camera shuts down. 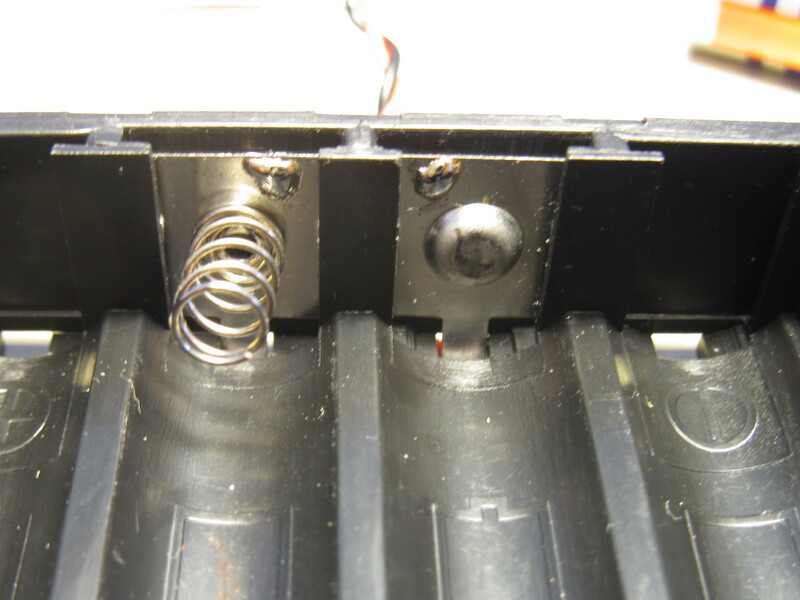 The main difficulty I had was that the space between the two batteries in the camera is very tight and I had to minimize the solder's thickness to let the battery block in. 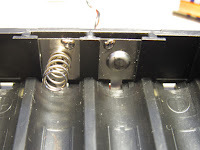 I also had to install some polycarbonate tape on one side to ensure that the metal part closing the battery holder doesn't short-circuit the positive and negative poles. 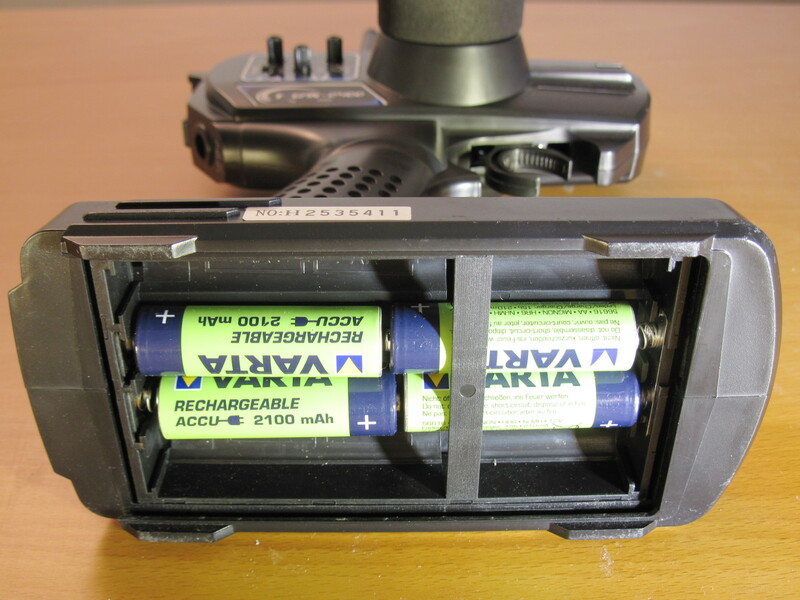 Unfortunately I didn't figure how to photograph my camera with the trap opened to see the batteries installed, but it's easy to imagine on this block on the photo at the top. What is nice is that I can still charge it using a regular Li-ion charger supporting 14500 to 18650 batteries. Let's see how long it will last now. 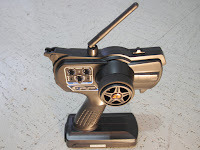 From time to time with a few friends we play with these RC cars but the problem is always the same : the transmitters require 4 AA-sized batteries. Since we have 4 cars, it means we need to find 16 charged AA batteries before going outside. It often takes much more time to find and test them as the time required to charge the cars themselves! This made me wonder if it would be possible to replace them with a set of USB-rechargeable lithium batteries that are more easily available and easier/faster to charge. 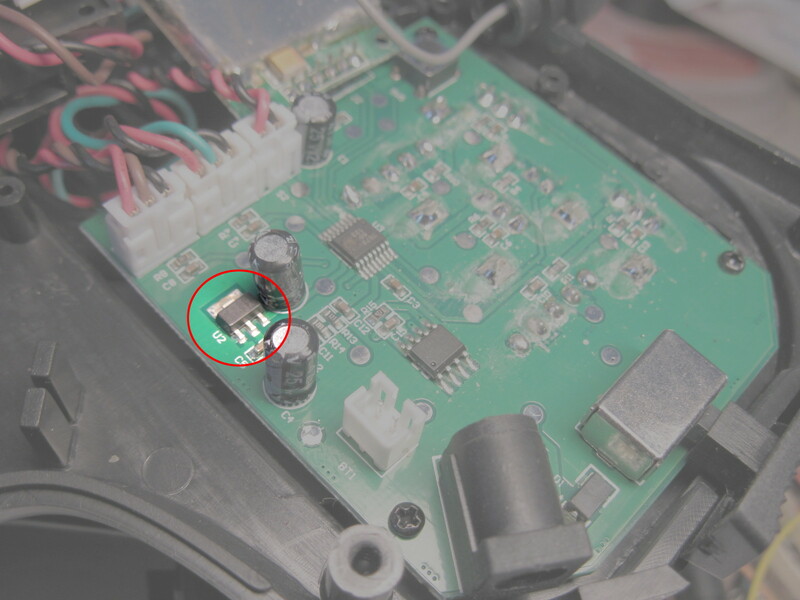 The marking "CA33G" indicates an AIC1734 LDO voltage regulator providing 3.3V from up to 12V in. It is said to feature only a 250mV drop at 300mA. I tried with an adjustable power supply and found that the board consumes only 61mA and that the regulator provides 3.3V starting with 3.44V in (144mV drop only). Better, this voltage drop is maintained for lower input voltages and the board seems to work fine down to 2.5V! Thus I don't need these 4.8-6V input. 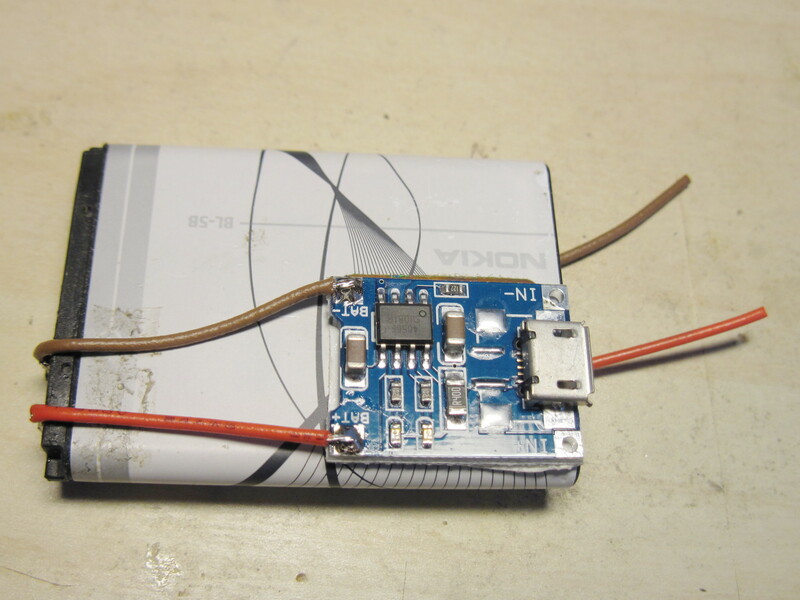 Using a single lithium battery from 3.5 to 4.2V will be far more than enough. No need for any DC-DC converter either. 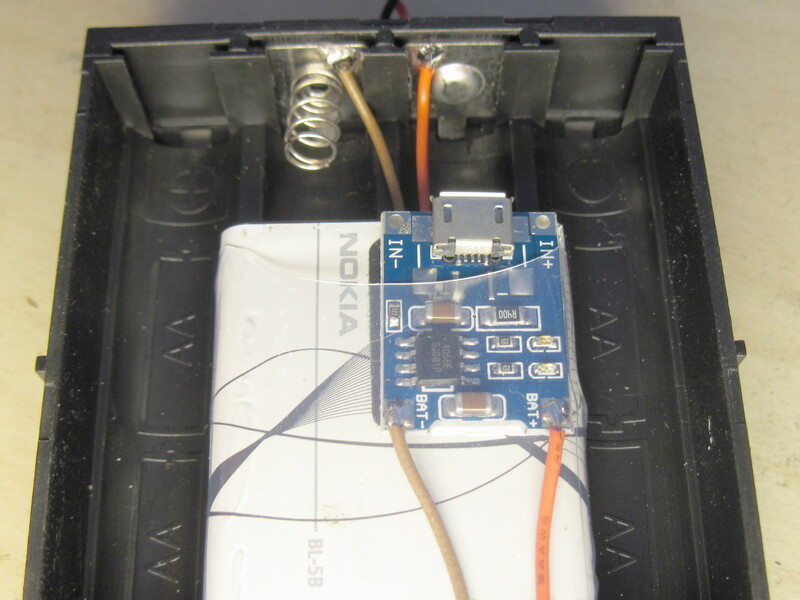 And given the low power draw, a small one is usable so that I don't have to modify the battery holder. I decided to go with some salvaged cellphone batteries. The one photographed here is a BL-5B with a capacity of 890mAh. It includes discharge protection. 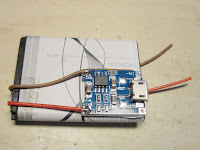 I simply had to glue a small dirt cheap USB lithium battery charging board to it (you can have 3 of them shipped for less than $1). 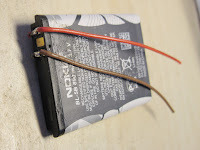 Then just solder it to the battery connection pads with hanging wires slightly longer than the battery itself. I measured the self-discharge caused by the charging board, it's around one micro-amp so it will need 100 years to discharge the battery. This saves me from having to install switches or connectors. 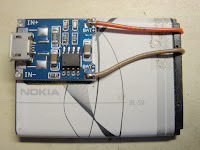 I closed everything, installed the battery inside a small plastic bubble protection bag to save it from moving inside, and I can now quickly charge it simply by opening the battery holder and connecting a micro-USB connector to the battery. A small note, the charger used above provides 1A by default, some are sold pre-configured to 500mA (just need to change the 1.2k resistor). It's better not to charge small batteries to strongly or they will not last long. Also the charger will stop around 10% of the configured load, which could be reached much earlier than a full charge for smaller batteries. 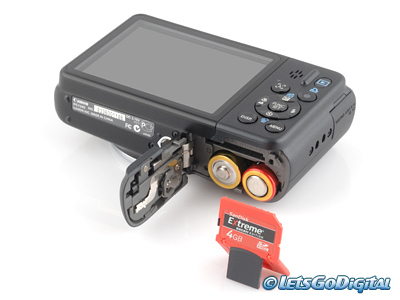 I've already patched two transmitters this way with batteries I had in stock. For next ones I'll probably use 250mAh batteries made for mini-quadcopters, which will provide 4 hours of operation and support being charged in only 20 minutes.